Learn About the Acura Sedan Packages to Select Your Future Car! If you've been looking to upgrade to a new 2019 Acura sedan, you're in luck. 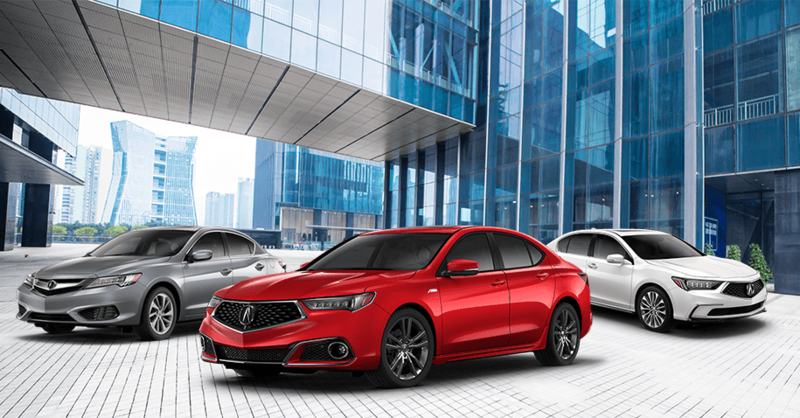 Our Acura dealership near Pasadena, CA, has a wide selection of Acura sedans for sale, including the 2019 Acura TLX, 2019 Acura RLX and 2019 Acura ILX. Explore all these models and compare 2019 Acura sedans at Acura of Glendale. We'll help you get the keys to a 2019 Acura sedan that suits you perfectly. Slide into the 2019 Acura TLX to experience a luxury sedan like no other. The standard 2.4-liter 4-cylinder engine outputs 206 horsepower and 182 pound-feet of torque, but you can upgrade to the 3.5-liter V6 engine to command the road with 290 horsepower and 267 pound-feet of torque. Choose between P-AWS® and SH-AWD®, then tackle your commutes with ease regardless of the road conditions. Interior features like an On Demand Multi-Use Display™ (ODMD™) 2.0 with eight-inch touchscreen for audio, phone and climate control, as well as Apple CarPlay™ and Android Auto™ compatibility. Innovative Jewel Eye® LED headlights provide you with a better view of the road, as they cast a wide beam of light and help reduce fatigue while driving. Plus, with safety features like Vehicle Stability Assist™ (VSA®), Adaptive Cruise Control with low-speed follow and a Collision Mitigation Braking System™ (CMBS™), you’ll always travel with peace of mind. When you opt for the 2019 Acura TLX Technology Package, you gain access to top-of-the-line infotainment features, cabin comforts and safety systems. Inside this luxurious sedan, you’ll find a Perforated Milano Premium Leather-Trimmed Interior among other available perks. Enjoy infotainment technologies like the Acura Navigation System with 3D View, AcuraLink® The Next Generation and GPS-Linked Climate Control. You can also listen to your favorite tunes with high-quality sound, thanks to the ELS Studio® Premium Audio System with 10 Speakers and HD™ Radio. Keep your passengers protected with driver-assistive technologies like a Blind Spot Information System, Rear Cross Traffic Monitor and Rain-Sensing Windshield Wipers. If you’ve added the Technology Package to your 2019 Acura TLX, you can couple those enticing features with the Advance Package for even more refinement. Interior tech like a heated steering wheel, 6-level heated and ventilated front seats and wireless charger make the cabin a haven of comfort, while Remote Engine Start with Vehicle Feedback brings extra convenience to your life. You’ll be able to maneuver in and out of parking lots and driveways with ease, as the Advance Package includes a Surround View Camera System, as well as Front and Rear Flush Parking Sensors. Heads will turn when you drive down the block, because your 2019 TLX will impress with its Gloss Black Rear Spoiler, power moonroof and Trapezoid LED Fog Lights. Take your Acura TLX with Technology Package to the next level and spring for the A-SPEC Package. A striking exterior design grabs attention with round dual exhaust outlets, dark chrome taillight details and 19-inch shark gray wheels. Tailor the cabin to your personal style when you choose between Black Alcantara® or Red Leather Seating with Contrast Stitching and Piping. The sport-inspired interior and dynamic design of Acura models equipped with the A-SPEC Package are simply stunning. The 2019 Acura ILX is a compact sport sedan that you can feel proud driving around California. A powerful 2.4-liter 4-cylinder engine provides you with 201 horsepower, 180 pound-feet of torque and a highway fuel economy of 34 mpg. * The new ILX looks fantastic from the outside, and when you climb inside you'll find a roomy and comfortable cabin filled with exciting features, many of which come standard. An 8-way power driver's seat with power lumbar support is sure to keep you relaxed as you pilot your vehicle. Meanwhile, dual-zone automatic climate control, humidity control, air filtration, active sound control and ambient cabin lighting create an environment of true calm and comfort. The AcuraWatch™ Plus Package offers everything in the base model plus a suite of features that assists you as you drive. The Adaptive Cruise Control reacts to the amount of space between you and the vehicle ahead of you, adjusting the throttle and brakes to keep a consistent distance between you and it. Other perks include the Collision Mitigation Braking System™ (CMBS™) and Lane Keeping Assist System. The Technology Plus Package, as you might expect, adds a wealth of high-tech benefits to the mix. Enjoy SiriusXM® Satellite Radio, Bluetooth® connectivity and a voice-controlled DJ called Song By Voice®. You also gain technology that can read text messages, group messages and emails aloud, real-time traffic and navigation systems and more. It also includes every feature of the AcuraWatch™ Plus package. The Premium Package is about the integrity of the driving experience, merging some of the perks from the two previous packages with better interior features. It includes a Blind Spot Information System, a Rear Cross Traffic Monitor, notification-reading technology and satellite radio, but it adds exclusive perks like an Acura Premium Audio System and HD Radio®. The 2019 Acura RLX is a must-have, efficient luxury sedan. Two different powertrain options give you the choice between a Sport Hybrid and a V6 engine. The V6 powertrain yields 310 horsepower, while the Sport Hybrid has a maximum output of 377 horsepower and earns up to 29 highway mpg. * This includes 3-Motor Sport Hybrid Super Handling All-Wheel Drive™ (SH-AWD®) and a 7-Speed Dual-Clutch Transmission. From ultimate refinement to exceptional rear passenger legroom, the new Acura RLX will have you in a world of comfort while behind the wheel. For a premium level of luxury, upgrade to the Advance Package for your new 2019 Acura RLX. Included with this package are heated and ventilated leather front seats. These seats offer 12-way adjustment, including 4-way lumbar support. Other features included in the Advance Package include the Krell® Premium Audio System with 14 speakers, Surround-View Camera System and Remote Engine Starter with Vehicle Feedback. Tech enthusiasts will want to upgrade to the available Technology Package, giving you access to a plethora of great features. Enjoy the convenience of GPS-Linked Climate Control. Not only that, but when you approach your vehicle with your Keyless Access remote the vehicle automatically remembers your climate preferences. Get to your destination faster thanks to the AcuraLink Real-Time Traffic™ system, which will reroute you around rush hour traffic if possible. Other features available in this package include acoustic glass, the Acura/ELS Studio® 3D Premium Audio System with 14 Speakers and AcuraWatch™ for advanced safety options. * Based on 2019 EPA mileage ratings. Use for comparison purposes only. Your actual mileage will vary, depending on how you drive and maintain your vehicle, driving conditions, battery pack age/condition (hybrid models only) and other factors.